The first thing that strikes you about Speed Racer DS is the movie-like presentation, aiming to please those who like the visual stlye of the movie was obviously top of the developers list. And with great source material, why not? It definately shows throughout the title, which is a credit to the developers. The game probably has more colours than a five year old’s Crayon collection! Furthermore (as in most DS games nowadays,) some excellent FMV is used as an introduction to the title and the menu’s all have a cool blue and orange vibe to them. The pace and atmosphere of the title is certainly evident from the off. The game holds no punches in hitting you with ‘typical’ racing options such as arcade races and tournament races – both with varying difficulty levels. A simple and neatly presented tutorial mode sets the scene for what is definately an off-the-rails racing package. Spins (ala F-Zero), flips, driving sideways and ‘Car-Fu’ are all commonplace terms that you will need to understand and master if you’re going to take pole position. Upon starting a race it initially appears that the graphics are garish and chunky as the machines appear washed out and sport minimal detail . Yet the moment you start to gain speed and start ripping through corkscrews and underpasses in giant neon cities, you will forget the vehicles as the futuristic cityscapes are the real draws here. Lush colour suddenly drapes around the courses with nice track designs forcing both the generic music and sound effects into the background. As a package, the title actually comes off looking great, sounding O.K yet more importantly, hosting a silky smooth, blazingly fast framerate. Infact, to get to those blazing races you will need to be boosting frequently, and this is where the major gameplay elements come into play. The trick system is vital to boosting and includes flipping and spinning your vehicle on lips and ramps littered around the course. It is both robust and intuitive working in a similar vein to Mario Kart Wii. 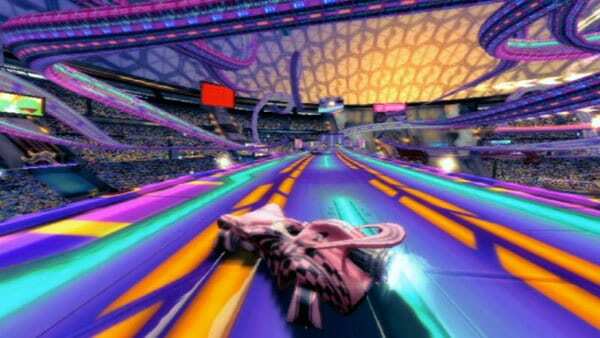 Sliding also rewards the player with boost and sees you holding L and holding the racing line. The bonus of boosting is that filling the boost meter enables you to reach “The Zone”. When in “The Zone” the background becomes a blue warp tunnel and you are guided around the course at massive speeds. Obviously, this is the best way to reach pole position. Apart from “The Zone”, the player is always in control of the racing mechanics and depending on the landing you make from various stunts, you can earn massive amounts of boost or none at all. With manga imagery of fans “swooning” represented on the bottom screen of the DS, you can see if you made a successful landing or take down. It’s a nice touch and even rewards you with a number of fans you’ve made. 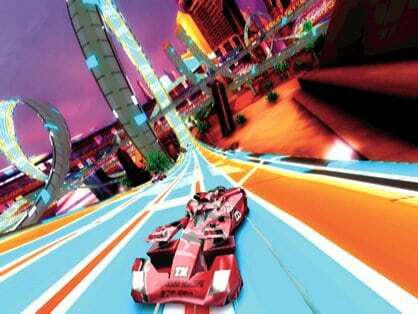 Even if it looks a little out of place in the serious world of Speed Racer it’s a nice element to the game and finishing with more fans than other racers has an addictive quality about it. Another form of gaining precious boost is by using Car-Fu to take out other racers. When you get close enough to a fellow racer, the “B” button will appear above their vehicle and pressing this will start a pre-determined animation of the two cars coming together in a warp-like tunnel. Along the top of the screen a long line will then appear. The letter X or Y will then move along the line opposite your computer opponents button. The idea is that you must press your button within a large red box in the middle of the line to get a takedown. The closest one to the middle of the line wins the battle. Unfortunately, this is far too easy to perform and most of the time you are guaranteed the take down. Even on the higher difficulty levels pressing the button at the right time proves easy and for the amount of boost you get it’s a quick way to get into pole position. It’s a good idea in theory but in practice it soon becomes a tiresome and cheap mechanic. As solid as the variety of locales and racers are it’s suprisingly the length of the races themselves which are the biggest flaw of the title. With a single race sometimes lasting up to four or five minutes it can actually become a boring experience. The truth is that you will easily get into first place on the first lap and still have another three minutes of the same track to race. Yawn. However, I must mention that this does become a mute point on the harder difficulties. So, somewhat surprisingly, Speed Racer takes the flag on the DS as the closest thing to F-Zero. And that’s no mean feat. If you’re a fan of the movie or just want an enjoyable futuristic racer, you could do a lot worse.